You believe in God. You’re trying to serve Him. But do you know how to truly love Him—and let Him love you? Are you ready to stop struggling to make time for God and instead live every moment with God? Discover how to live with your heart wide open. When I saw the title and description of this book, I was intrigued and ordered it straight away. I couldn't wait to dive into it. I mean, read the description above, put sizzle in your Bible study? Trade formulaic devotions for a devoted life? Count me in! "When all you can bring Him is a broken want-to". She gives sample prayers to pray that hit home to me. I've said before, I'm a "God talk" girl. I talk to Him like He's sitting right beside me. My words aren't fancy, and they don't need to be, it’s the heart attitude to which God responds. She includes prayers like, “Jesus, I know I don’t love You like I should, but I want to love You” and “Lord, teach me how to live devoted beyond my daily devotional.” In the back of the book she includes a Bible study and discussion guide that would help individuals and small groups go deeper. I really appreciated her willingness to share her own experiences. And, of course, I can always appreciate some good humor! Her ability to use humor yet still convey the magnitude of things like God’s desire to know us personally, and living in the power of the Holy Spirit rather than our own strength. 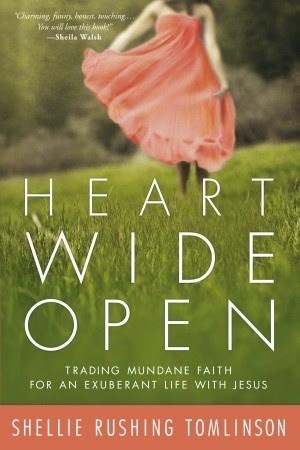 Click here to download chapter one of Heart Wide Open.